In our Business Spotlight feature, we ask business founders and owners to tell us their story. How did they start their business? How has it been different to what they expected? How are things looking now? What advice would they give other business owners and people thinking about starting a business? Julie Stanford: Welcome to Essential Business Radio. I’m Julie Stanford. 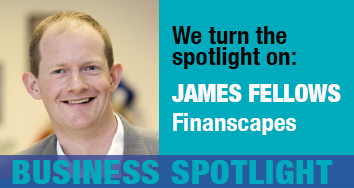 Today I’m joined by James Fellows, director of Finanscapes, online forecasting software for your business. I wanted to find out more about the company and asked James how he started, how things are going now, and what’s going on for the future. I’m delighted to have you join us today. Tell us more about Finanscapes how you started the business and your background. James Fellows: Of course. Well, I started the business a little bit over three years ago. I did so after I joined an MBA programme at the university, sponsored by my-then employer. I realized that all of this business stuff that I’d been doing, skills that I built up, I wanted to apply those more on my own terms in my own business and take more ownership of it. I saw that there was an opportunity to join an incubator programme there run by the university, which was due to start about six months after I joined the MBA. When the opportunity came up to take redundancy from my existing employer, I did, and went over and started Finanscapes. I come from ten years’ experience in financial services, and so I knew that I wanted to start a financial business, a financial software business. I decided that I wanted to make a difference to people’s personal finances. So when I started the business it was all about personal financial forecasting, but it became clear quite quickly, after only a few months, just how much difficulty the other people on the programme were having with getting their head around their business numbers. The mentors gave me that same picture as well. They spent enormous amount of time, and a lot of patience, helping people to get to grips with their cash flow forecast and their profitability, and so on. So I realised, just as it happens with a lot of businesses I guess, I was going to change what I’d originally set out to do and design the whole software platform around making the business forecasting process simple, easy, and painless. Julie Stanford: It was that that was exciting to me when I saw it actually. Because as a business owner of many years, I had struggled with exactly those things, with forecasting, with understanding why it needed to happen and then how to do it, having the tools, the flexible tools to do it. It’s interesting that you say that you started out one way and then changed it in response to, well, the shared experiences with your colleagues. James Fellows: Absolutely. It’s a problem that, I suppose, because I enjoy numbers and I find it relatively easy, I’d ignored the fact that that wasn’t the case for everyone else. It was working with all sorts of fantastic, creative, committed entrepreneurs on the programme who were great at doing things that I just wasn’t. When I realised it this was a big opportunity for me to build a successful business, but for it to have a bigger impact in the wider community. Julie Stanford: Tell me a bit about those early stages then. You started out with one idea, one business model idea, but then quite quickly changed it. In practical terms how did that work? What did you do? Did you bring in a team? How did you start with this business? James Fellows: Well, right up front and early on, I was bootstrapping the business, so I was keen to do everything myself and confident that I could do. That’s a lesson that I think the mentors and other business owners that I’ve spoken to told me quite correctly, “It doesn’t work like that. You’re not going to be great at everything. Don’t try to take it all on yourself.” But unfortunately it took me a long time to learn that lesson. I was doing as much as I could in the business, in terms of building the web presence and doing a little bit of marketing, building the software side as well. But I took on a freelancer to help me with the software build side. During that period, it helped me to get to grips with the fact that there are some things that I’m great at and there is some things that I’m not so great at. But at the end of the day your time can only scale so far. That was a lesson that I really needed to learn. I’m pleased I learned it quite early on as well. As a result then, things started to build momentum and started to take off. That would happen just before I realised that there was this bigger opportunity out there to help people with their ‘start a business’ forecast rather than personal financial forecasting. But that was actually, looking back that was fantastic, because I made some of those mistakes, I did some of those slightly shortsighted things, in an area or part of the business where it didn’t have a long-term impact. So when I started fresh on the start of financial forecasting I got a much better handle on how to do this. Julie Stanford: So, all of that experience led to you being able to bring that experience into this current business and this business model? James Fellows: That’s absolutely right, absolutely right. I’m still learning today obviously. I’ve built a team that’s exclusively populated by freelancers now, where they all sit in the same office, and I use different people to different extent, but it was learning that lesson really on that’s made quite a difference. Of course you’ll know from your experience, Julie, that keeping those fixed cost down is important, getting the right skills in the right places. There’s an old corporate saying, “Getting the right people on the bus is fine, but you got to have them in the right seats as well.” Those are really, really important lessons that I’m pleased I learned early on, so that I can focus my time now on making all sorts of other mistakes. Julie Stanford: Well, it’s brilliant though that you did because that’s probably one of the biggest mistakes that people make. Because there isn’t a great deal of money available they tend to try and do everything. Of course, it’s false economy sometimes because it just takes you twice as long as a good freelance professional. That model of bringing in freelance is one that’s used so often now I think by early stage businesses and even people have been going a long time, because it keeps the cost very controllable. Keeping those costs tight means that if you need people to produce a project or for a particular part of the business, you can bring them in, pay them, and then they go off and do it for other people and you keep your costs very tight. What is happening with the business currently? Julie Stanford: I’m just thinking then James where are things now? We’ve talked a bit about how you got to where you are now. Where is it at the moment for Finanscapes? James Fellows: I plan the business on a quarter by quarter basis, so I put together an idea of what it is that I want to do over the course of the next three years. Then break it back to the next 12 months. Then in detail, breaking it into quarters. My focus for this year is all about sales, so we’ve got a really reliable robust program and we sell it already to universities and enterprise agencies and accountants and direct to entrepreneurs, all the way across the world. But it’s a software business and that involves a massive amount of up-front investment. All that money is gone in now. It’s all about now scaling it, so that the business is profitable on a long-term basis. That’s what I’m focusing on at the moment. It ties in with what you were just saying a moment ago about those resources. Marketing is quite a big focus at the moment. Lindsey, our marketing freelancer, is working really hard at the moment to scale up that resource and really capitalising on our expertise to build our web presence, to make people much more aware of us, so that then the sales can come in to some extent on our own through the website. Because, of course, the point of the tool is that people can use it simply and easily on their own. That process of selling to individuals or acquiring end user entrepreneurs on their own is very, very scalable for us. Whereas a sale to enterprise agencies and universities and accountants, they’re bigger unit cost items because these guys buy hundreds of licences at a time, but they take a lot more effort in set up from the team. That’s our focus at the moment. Part of that marketing push actually, is just a few days ago we were shortlisted for an award for early stage businesses for the Venturefest East Midlands Award. Julie Stanford: Oh wonderful. Congratulations. James Fellows: Which is fantastic news. Yeah, absolutely. That’s the sort of activity. Now we put ourselves up for awards at least every six months. Part of it, in all honesty Julie, is to remind ourselves why we’re doing this, to tell the story, and to keep us focused on what we’re doing. Sometimes it pays off, sometimes it doesn’t. But this is a really exciting one, because of course it’s all about entrepreneurs and people starting their own businesses. So that’s fantastic. On the business to business side, I just heard this morning that the Startup Loans Company have said that they’re happy to receive start-up loans forecasts through Finanscapes as well, which again is a big leap on for us this time on the business to business side. So, the enterprise agency that is processing your startup loan offers you Finanscapes, you get the opportunity to do the forecast there in one place, in that same environment, and then submit it on, which is a fantastic win for us and it’s just helping the business to grow both on the consumer side and the organisational side. Julie Stanford: Knowing what I know about what’s available for businesses, I think that’s a fantastic piece of news, actually James, because so often business owners are completely confused by the notion of forecasting. It’s that that drew me to your software. We met obviously at an event but then I went on to look at your software, play with it, and put information into it. I was very, very impressed at how simple and yet powerful it is. One of the things that it says on your site that really made me smile because it’s so true: ‘Forecasting is cheap and failing is expensive’. That is a very good line because it is absolutely true, isn’t it? James Fellows: It is absolutely true. I know that we’ll be talking about my tips for business success or how I’ve managed to get this far in a later episode, but that’s one of them, is thinking is easy, is cheap. Doing it is quite expensive and failing it really does hurt. So just take a little bit of time, upfront, to think through your business, not just the numbers obviously, but how you’re going to market it, what your target market is, all the things that I know you cover Julie in your Essential Business guides and in those Nudges and so on. Half a million businesses are started every year but more than half of those have died within those first few years. So putting that thought in and just taking a step back and designing your business and working on it rather than just in it can absolutely pay dividends. Julie Stanford: Now it can transform a business. It also can transform that business owner’s experience of the business. Because it’s terrible, if things are tough and you’re struggling to do everything on your own and it’s still not working, that can be the most awful position to get into. People can acquire the skills, they can learn how to do it, which is why we do Essential Business Radio and talk to people like you. It’s to help you pass on everything you’ve learned and all that you know to business owners so that they don’t have to go through it and suffer that, the paint of not knowing. What do you have planned for the future of your business? I’m keen just to for these last few minutes of this business spotlight actually James just to find out more about the future of the business. What’s ahead for Finanscapes let’s say in the next three to five years? What are the plans? James Fellows: The plan is probably split broadly into two sides, so there’s plans for the underlying product itself, the Finanscapes tool. The tool itself has evolved and all of the functionalities come about as a result of feedback from entrepreneurs, from experts such as yourself, and from business mentors and advisers across the country who provide us with feedback and so you know what, it will be better if it worked like this or better if it worked like that. So there are some big chunks of functionality that we’re expecting to put in over the course of the next, well, hopefully the next 12 months but potentially longer. One of those is integrating with accounting software. What Finanscapes does is all about the forecast, it’s all about making better informed decisions upfront by looking at how the numbers are likely to play out. Accounting software is the other way around. It’s about looking at what’s actually happened already and seeing what results that’s caused. Accounting software doesn’t try to get into the forecasting, and we certainly don’t want to get into the accounting side. But marrying those two is an objective for us. Because you’ll appreciate we’re in quite a lot of pressure from the various accountants that buy the software to do that. I can certainly see the opportunity there for the entrepreneur as well. As they move forward they’ve got an idea of what their business is going to be and they start to take things forward. They start to record their actuals. After the first six months, nine months, 12 months you really need to be thinking, okay, how does this compare with what I originally expected I was going to do? So that accounting software integration is a big one for us. There are other small pieces of functionality that we’ve already got on the roadmap. Then the other side, in terms of the business itself, we’ve got thousands of users as I say all around the world at the moment. It’s all about growing that user base. Interestingly, just a few days ago we took on our first customer from China. Now that’s an interesting one because of course we don’t market it anywhere outside the UK. As I said earlier there’s a half a million new businesses that start in the UK every year, which is a phenomenal size of marketing, if only we can access it. Because in all honesty, I think most of us when we’re getting into the process of starting our business, and setting or running them in the early months and probably years, we get really stuck into the doing and working in the business, and knocking out widgets for example, whatever they might be, and lose track a little bit to that more strategic side. So partnering with those bigger organisations whether a enterprise agency or whatever, those are all important things for us over the course of the next few years. Julie Stanford: Excellent. Well, it all sounds extremely exciting James, and as I say, I think it’s a fantastic piece of software. I wish it’d been around. Well, I mean, I’m glad it’s around now, but I wish it’d been around when I was struggling all those years ago to get my head around forecasting, because it’s vital that you know where your business is, where you’re going, and the figures are crucial to that knowledge. I just want to say, thank you very much for taking time out of your day to join us on Essential Business Radio, James Fellows, director of Finanscapes, online forecasting software for your business. Thank you for coming along. James Fellows: Thank you very much for having me. Julie Stanford: You’ve been listening to Essential Business Radio and I’m Julie Stanford. Thank you for listening. If you want to find out more about James Fellows and Finanscapes, visit www.finanscapes.com. For over ten years, Essential Business has produced books, workbooks and training courses to help other business owners, advisors and educators with the practicalities and realities of running a business.